It was recommended by a health care person and I do think it is helping. 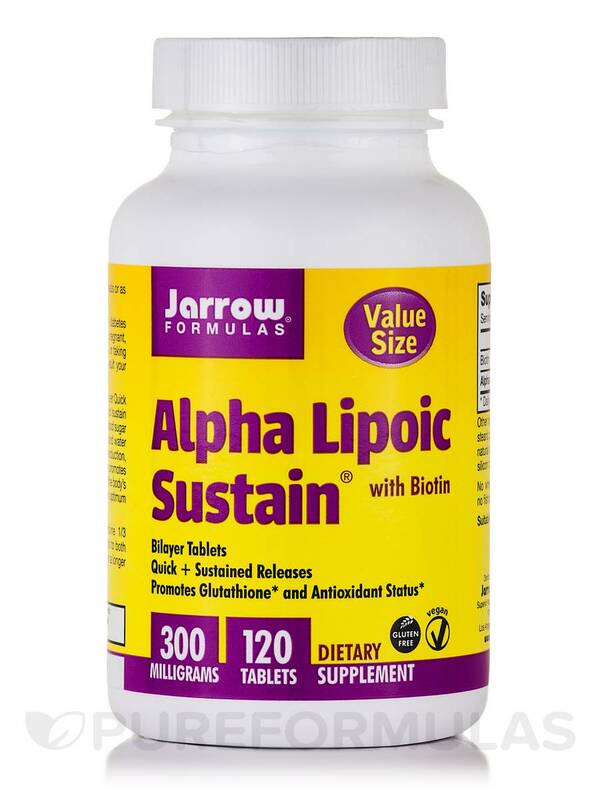 Alpha Lipoic Sustain with Biotin by Jarrow Formulas is a very good product and with PureFormulas price you can't beat it. 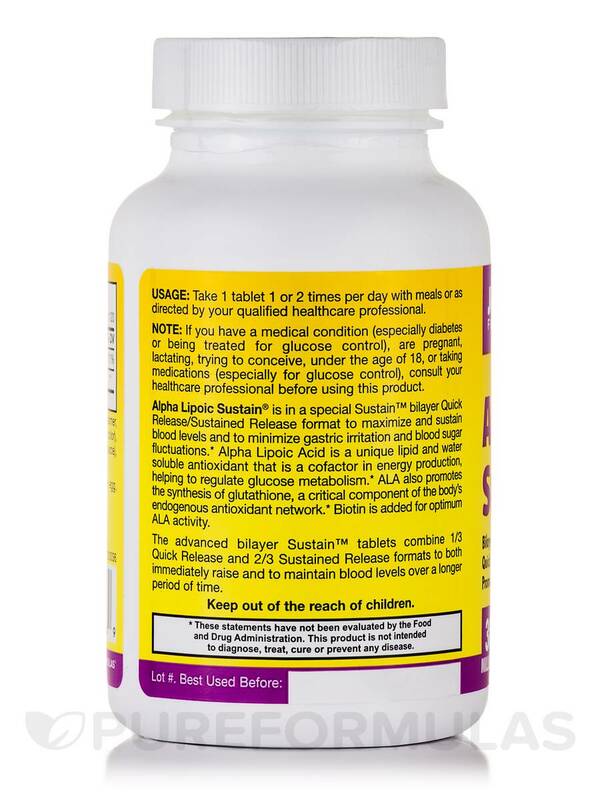 Alpha Lipoic Sustain® with Biotin 120 Tablets from Jarrow Formulas® may promote the production of glutathione‚ which is an antioxidant. 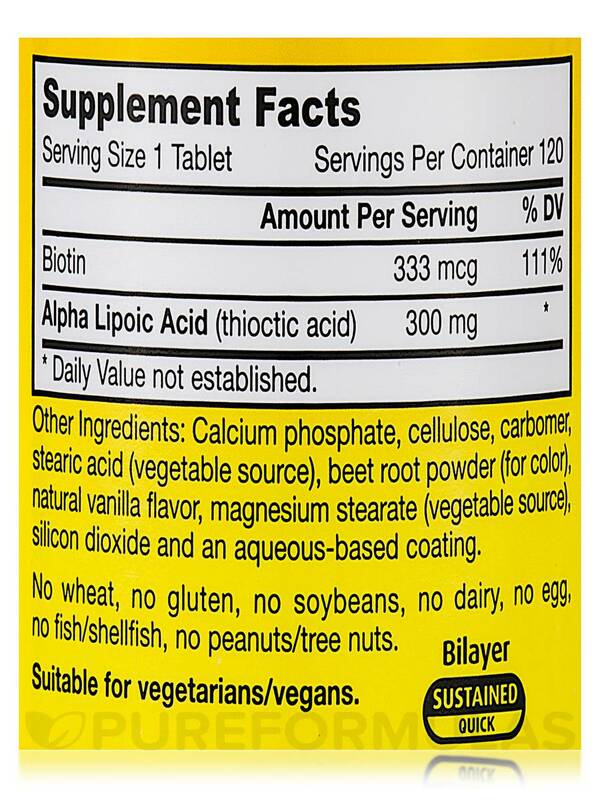 Alpha-lipoic acid (ALA) is a fat and water-soluble antioxidant. Apart from being a cofactor in the production of energy‚ ALA may also improve the synthesis of glutathione‚ an important antioxidant. Antioxidants could provide protection from free radicals. Free radicals are atoms or groups of atoms with unpaired electrons that are formed when oxygen interacts with certain molecules. ALA is also known for its ability to recycle vitamins E and C in the body. 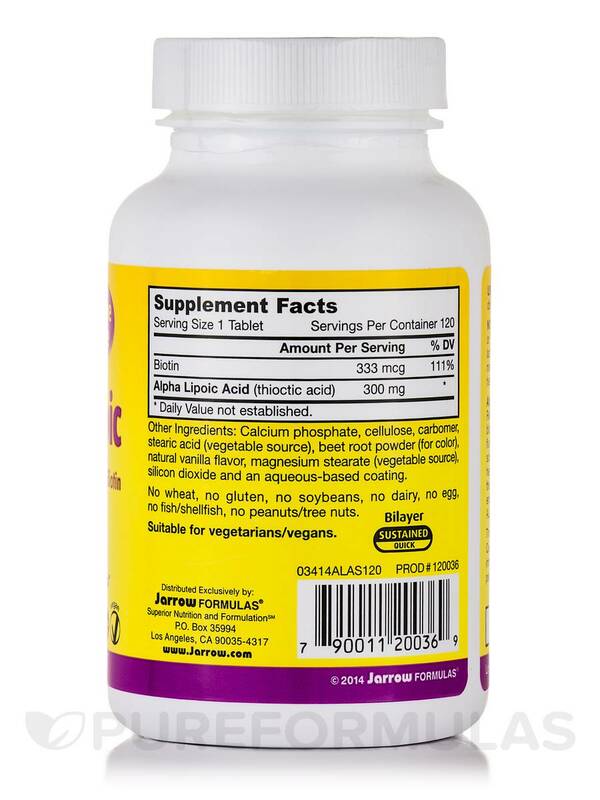 Alpha-lipoic acid‚ as present in the supplement from Jarrow Formulas®‚ may support the synthesis of carbohydrates and aid in the glucose metabolism process within cells. Biotin is a water-soluble vitamin and is an essential cofactor in the production of energy and lipid metabolism. Studies show that biotin may support the activity of ALA. The advanced bilayer tablets combine 1/3 Quick Release and 2/3 Sustained Release formats to help instantly raise and maintain blood levels over a longer period of time. 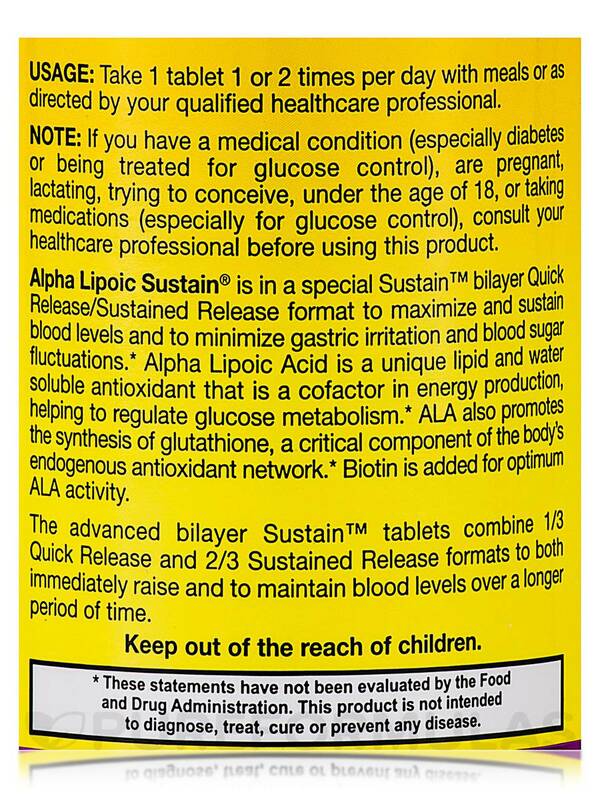 Alpha Lipoic Sustain® with Biotin 120 Tablets from Jarrow Formulas® is suitable for vegetarians and vegans and is free of wheat‚ gluten‚ soybeans‚ dairy‚ eggs‚ fish/shellfish‚ and peanuts/tree nuts. I purchase Alpha Lipoic Sustain with Biotin by Jarrow Formulas for my brother. It is his favorite for helping him with his Diabetes. He has tried many other brands but says "Jarrow Formulas works the best". I like the fact that it is sustained and that it also has Biotin in it. I have been taking Alpha Lipoic Sustain for over six months and it really helps with arthritis pain. Also I am pre diabetic so an extra Plus that it helps me maintain my blood sugar.